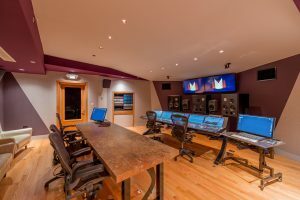 Manhattan Center, New York’s premier venue for events, concerts, TV and recording production, has completed renovating its Studio-7 recording facility. The technical upgrade included equipping the control room with sound and mixing and production systems, expanding workplaces for producers, and installing the new 80-fader IP-based mc²56 production console from German technology pioneer, Lawo. The improvements were supervised by architectural acoustic designer Francis Manzella, FM Design LTD.
Having made history in 1926 by recording cinema’s first-ever film score for the John Barrymore and Mary Astor classic Don Juan, Manhattan Center remains one of New York’s premier scoring stages. With a portfolio of credits that reflects both the development of cinema and of sound recording, renown composers who have used the facility include Clint Mansell (Noah), A.R. Rahman (The 100 Foot Journey) and Oscar-winner Elliot Goldenthal (Frieda, Across the Universe) to name a few. Scores recently recorded utilizing the Lawo audio board in Studio-7 include: Prince of Broadway Cast Album; Goldenthal’s Our Souls at Night for Netflix, and The Marvelous Mrs. Maisel produced by Stewart Lerman and arranged by Bill Elliott for Amazon Prime. “Manhattan Center’s recording studios and event spaces have a long history of supporting the music industry in New York, and we strive to maintain a high level of functionality,” says Markus Karr, President, Manhattan Center. The acclaimed Lawo console replaced an analog console that could no longer meet the demands of ambitious, complex, and high-quality recordings of orchestras and film scores hosted by Manhattan Center productions. Additionally, the new console has introduced modern, efficient, and flexible workflows to add to the overall quality of film score recordings, and cleared the studio of bulky cabling systems. With productions including live bands and TV shows requiring many channels, the DSP and routing capacity of the Lawo console ensures smooth operation, and the performance, channel count, routing capacity, and feature set are a match for the requirements of live TV production.